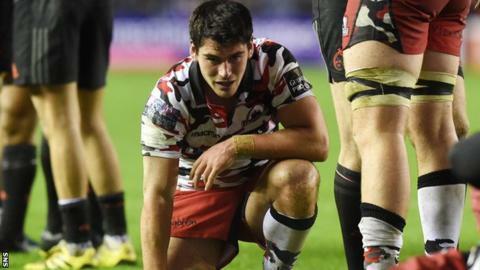 The return of Edinburgh's Scotland internationals from the Rugby World Cup has caused "disruption" to the team, according to Sam Hidalgo-Clyne. But the scrum-half insists Alan Solomons' side will readjust as they seek to recover from three defeats. Edinburgh welcomed back four Scotland caps against Munster, but went down 16-14 at Murrayfield on Saturday evening. "It's a long old season so we'll gel as a team and we'll bounce back," said Hidalgo-Clyne, 22. "You could say it's a disruption, the guys coming back and learning the calls and trying to get used to playing with each other again." After winning their first four Pro12 matches this season the Murrayfield side have lost to Zebre, Connacht and now Munster. Saturday's game marked the return of the Scotland front-row combination of Alasdair Dickinson, Ross Ford and WP Nel, as well as centre Matt Scott. Despite being a member of Scotland's World Cup squad, Hidalgo-Clyne returned to Edinburgh colours the week after the national side lost the quarter-final to Australia on 18 October. "The Connachts and the Scarlets always do very well because they don't have many internationals," Hidalgo-Clyne told BBC Scotland. "The first four games we did well but we didn't have our internationalists out there. It's always hard when teams come back and strengthen their side." Edinburgh now switch their attention to Europe and their first Challenge Cup group match against Grenoble on Friday. The side may include a further two Scotland forwards if head coach Solomons decides to bring back David Denton and introduce new signing John Hardie. After reaching the final of the competition last season, Hidalgo-Clyne admits teams may now be targeting Edinburgh. "I think that always happens," he added. "You go that far and you make a name for yourselves so you're going to be targeted. "We've just got to make sure that we don't get ahead of ourselves. "We lost this week so we need to go back to the drawing board, work out the opportunities we missed and try and build on it. We always enjoy playing in Europe."